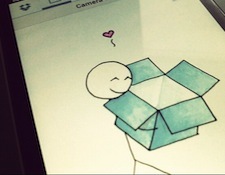 Dropbox has quietly updated its iOS apps, adding options to share content directly to Facebook and Twitter. Previously, sharing support was limited to email, but now you can tweet content or post it to your Facebook Timeline. You can also share more sensitive documents through a Facebook message. Although we don’t imagine that many businesses will frequently share Dropbox documents, it could come in handy for uploading photos to social networks, particularly Twitter. At this time, there doesn’t seem to be support for Facebook Pages, meaning that content will be shared through your personal Facebook account. This is a smart move for Dropbox as more of its links will now be seen on two of the largest social networks. And the timing couldn’t be more perfect, considering that Twitter has just disabled the option to upload photos through third-party services on its mobile app. Dropbox version 1.5.5 also provides AirPrint support, so you can now print photos, emails, and documents wirelessly from your Dropbox account.